I had barely seen any of the movies nominated for Oscars last night: Flight, and a handful of the kids’/Snow White type movies (it was a weird year.) However, I watched the Academy Awards because I was looking forward to hanging out with Twitter as I did so. Tweeting the Academy Awards feels like you’re at an Oscar party, only one where you don’t have to put on shoes, where you can fart freely, where you don’t have to drive home afterwards and where Steve Martin is in attendance. The most popular Tweets, of course, tend to be the funniest ones and the funniest Tweets, if not to me, then to everybody else, are either the weirdest or the most cutting. It’s easy to put celebs down at the Oscars: they’re inflated with ego, they’re outrageously overpaid, and on Twitter we can work out our self-hatred over being so obsessed with entertainers. On Twitter you can hate-love and love-hate the entertainment industry with people who won&apos;t judge you. When Jennifer Aniston presented a category in a flowy bright red gown, I drafted a Tweet: “Jennifer Aniston’s uterus looks especially empty right now.” But my hands hovered over the keyboard before hitting “Tweet.” Something didn’t feel quite right about this. The “joke” of the Tweet was the constant speculation over whether Aniston is pregnant or not, and/or whether her lack of fruitfulness drove Brad Pitt into Angelina Jolie’s fertile arms. (Also, it could have been a compliment to how svelte she looked? But not really.) It didn’t feel right, though. Maybe Aniston has struggled mightily with fertility or maybe she just doesn’t want kids, a position I utterly respect and understand. Moreover though, I felt like this was not a joke that would go over well and that I didn’t want to have to defend. It just wasn&apos;t that funny. I deleted and moved on to something else. 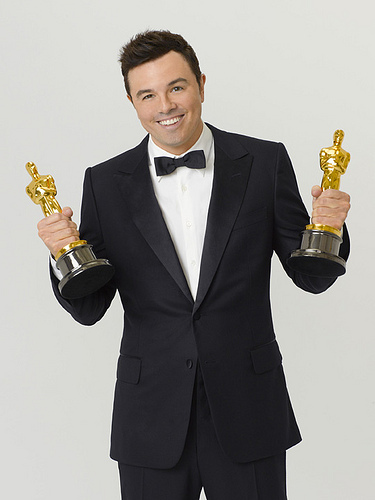 At least two entities are smelling pretty bad this morning after the Oscars: host Seth MacFarlane and The Onion, MacFarlane for various jokes and The Onion for writing a Tweet that sounded like it was calling nine-year-old Quvenzhane Wallis the c-word. I don’t think either MacFarlane or whomever was writing the Onion Tweet worked with malice, but instead with the mistaken impression that edgier is better. MacFarlane actually had a couple of good jokes in his broadcast (the Sound of Music one was cute) and I can see that the Onion Tweet had the seeds of a good satirical joke about female competition and celebrity gossip in it. But both pushed the envelope in a cheap direction. MacFarlane’s jokes came pre-packaged with “You won’t be able to handle this!” comebacks (like his Lincoln assassination joke, which he followed up with an obviously-rehearsed “too soon?” retort) and The Onion crossed two major lines: using one of the worst words and using it on someone too young to either defend herself or to have to know what that word means. The jokes were insulting but almost as bad, just not very funny. All these jokes could have been retold or remade in some way so as not to go the jerk route. But in the world of reTweets and comments and likes and everything, subtlety and sensitivity doesn’t always pay off in terms of eyeballs and buzz. Both MacFarlane and the Onion have been praised when they’ve used tastelessness in clever and pointed ways. But that doesn’t work 100 percent of the time. I have a story I’ve told a million times about a celebrity who reached out to me and let me know he didn’t care for a joke I made at his expense in a publication. I was mortified, not so much because I had hurt his feelings, but because it was a cheap, lousy joke that I didn’t want to stand behind. If it had been Chris Brown emailing me to complain that he doesn’t like being depicted as a petulant, violent s.o.b., I wouldn’t have felt bad. But in this case, it wasn’t a hill I wanted to die on. I should have listened to my gut. Same thing goes with MacFarlane and the Onion Tweeter. Some jokes are worth taking the hit for if they’re more clever than angry, more absurd than obscene. But sometimes you just have to think of people’s feelings, and/or, in a more self-centered vein, the damage control you’ll have to do. Will it be worth it? If not, revise, rewrite, re-Tweet. It’s possible to make be edgy, rude and clever without being a complete c-word about it.